With her father dead and her brother Thomas, her only sibling, injured in service with the British forces in the American colonies, Cecilia Harcourt is alone. Refusing to be bullied into marrying her repulsive cousin Horace, who stands to inherit her home if her brother does not survive, she leaves the tiny Derbyshire village where she has lived all of her life and sets sail for New York to join her brother and provide the care that could save his life. But when she arrives, Thomas is missing, and the officers in charge seem unconcerned about finding him. While she is waiting for news of her brother, Cecilia decides to care for his best friend, Captain Edward Rokesby, who is lying unconscious in a Manhattan church transformed into a hospital for wounded British soldiers. Unfortunately, the officers in charge are not about to allow an insignificant civilian with no familial ties into the hospital to care for an injured officer, especially one who is the second son of an earl. Frustrated with military protocols, Cecilia announces that she is the wife of Rokesby, a man she knows only through her brother’s letters. She cares for the wounded Rokesby with tenderness and compassion, angrily rejecting suggestions that he may not awaken from his unconscious state. A few days later, Edward Rokesby begins to awaken. He is confused to hear a man addressing a woman as “Mrs. Rokesby,” but when he opens his eyes and sees the woman, he recognizes her from the miniature her fond brother carried with him, a miniature Edward has carefully studied. Cecilia expects Edward’s first word, “Cecilia,” to be followed by his denunciation of her, but he has lost all memory of the past two months. He doesn’t feel married, but he accepts what he is told. He ensures that Cecilia receives the respect she is due as his wife. Cecilia intends to tell him the truth as soon as they have some privacy, but it soon becomes clear that the army is much more eager to find Thomas when they are pressured to do so by an earl’s son. She cannot bring herself to refuse that advantage, and so her deception continues. When Edward is released from the hospital, still weak and in considerable pain, he and Cecilia are given a room at an inn that has become officer’s barracks. The quarters and the food are far superior to what Cecilia has been able to find with her meager resources, and Edward sets in motion a new search for Thomas. Guilt-ridden, Cecilia continues in the role of Mrs. Edward Rokesby. His unexpected marriage makes Edward even more eager to recover his memory, but the more time he and Cecilia spend together, the more he becomes convinced that she is even more than her miniature and her letters promised, that she is indeed the perfect wife for him. Cecilia’s feelings for Edward are also growing, as is her guilt for deceiving him. Of course, the more she cares for him, the more difficult it becomes to reveal the truth. What Edward accepts is real, she knows is only make-believe. It is a measure of Julia Quinn’s skill that she could take two tropes—a protagonist’s amnesia and fake identity—that I generally regard with a high degree of skepticism and engage me blissfully in the story. She succeeds in part because Edward’s amnesia is brief in span and duration and because Cecilia’s motives are unselfish and she knows the deception is wrong. It also helped that I loved both characters. Cecilia is courageous, but hers is not a stupid courage. She is aware of the risks she is taking, but the risks are preferable to the alternative. The bond between her and Thomas, as revealed in the snippets of letters which introduce chapters and in Cecilia’s thoughts, is real and powerful. Edward’s vulnerability and his difficulty in accepting the physical and mental limitations that are the consequences of his wounds render him a more complex and appealing hero than just another charming, roguish aristocrat could be. As these two move from near-strangers to lovers, every move felt true to who they are and to the feelings that are developing between them. If I were rating the book only on the romance, I would give it five stars. But Quinn introduces a mystery element with Thomas’s disappearance, and I found it less satisfactory. Without moving into spoiler territory, I’ll just say that I found the resolution disappointing in light of the reader’s emotional investment in the character. Also, if you have seen this book described as “Julia Quinn’s American historical” be aware that it is not. Quinn places Edward in the American colonies because that’s where she left him when he was declared missing in the book that preceded this one. Most of the action takes place in New York, but it is a New York under British control. The characters, with rare exception, are British, and it is their story. The war Edward, Thomas, and their fellows are fighting is the American Revolution, but the point of view is British. This is the second book in the Rokesby series, and while it has connections to the first book, mostly through references to Billie Bridgerton, it can be understood easily without having read Because of Miss Bridgerton. 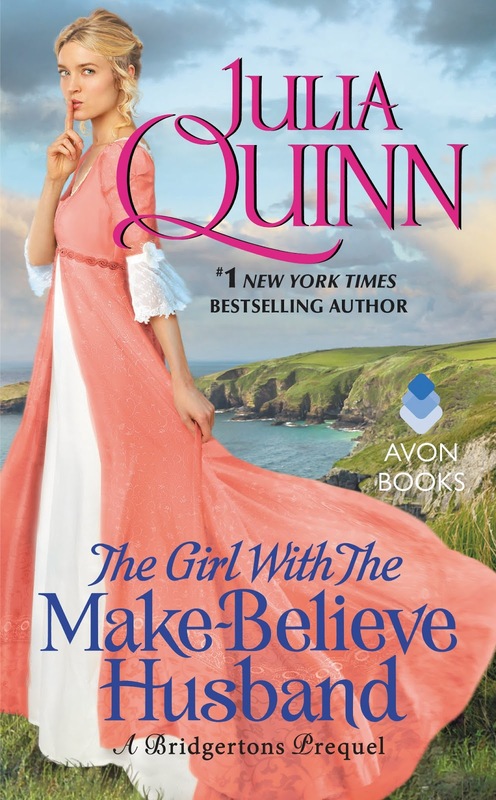 If you are a Julia Quinn fan, you will likely delight in the romance and turn the last page with a smile, eager for the next installment in the Rokesby family tales. 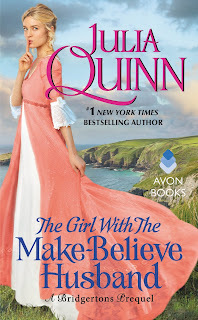 If you haven’t read Julia Quinn (I’m assuming there are a few of you who have not), as long as you do not expect deep historical background, you will find The Girl with the Make-Believe Husband typical Quinn, albeit with some darker tones: imaginative, engaging, and great fun. Julia Quinn is one of my auto-buy authors, and this book makes me happy she is. JQ is one of my auto-buy authors too. Ms Quinn is one of the best. This sounds wonderful and another winner from Julia.